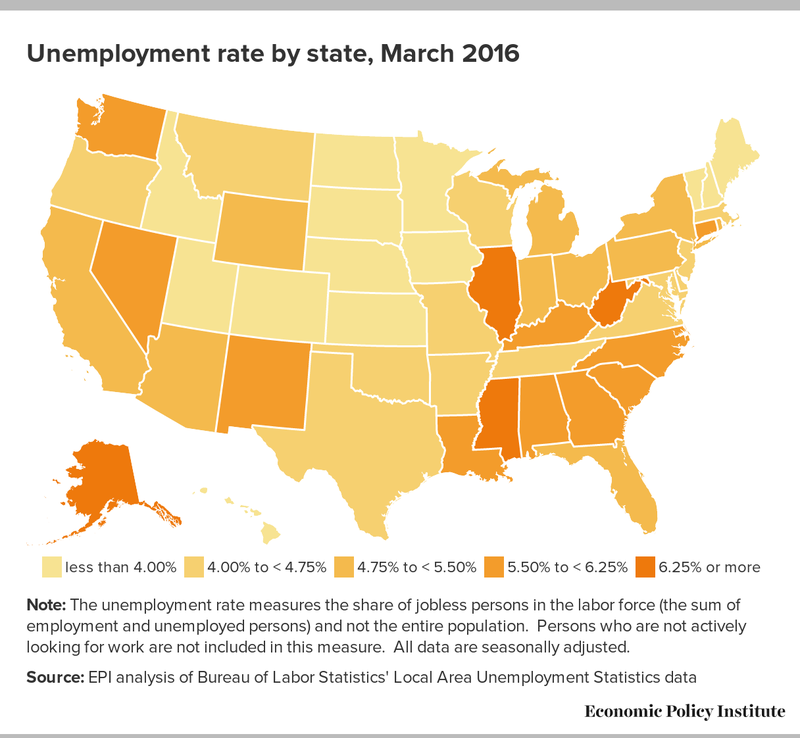 The Regional and State Employment and Unemployment report for March was released today by the Bureau of Labor Statistics and the data show a continuation of what has been a steady improvement in the economies of most states. The exceptions to these positive trends are states with energy-dependent economies that have lost jobs and seen their unemployment rates go up. From December 2015 to March 2016, 30 states and the District of Columbia saw their unemployment rates decline, while 14 states saw unemployment rise. This is a drop in the number of states with falling unemployment rates. Though we expect that to happen to some extent as we get closer to pre-recession levels of unemployment, 25 states and the District of Columbia still have unemployment rates higher than where they were in December 2007. The states with the largest declines in their unemployment rates were Tennessee (-1.1 percentage points), Oregon (-1.0 percentage points), and Arkansas (-0.7 percentage points). States with the largest increases in their unemployment rates were Wyoming (+0.8 percentage points), followed by Illinois, Indiana, and North Dakota (+0.4 percentage points for all three). Six states experienced no change at all in their unemployment rates. From December 2015 to March 2016, 40 states and the District of Columbia added jobs. The largest winners noticeably all occurred in Western states: Hawaii (+1.7 percent), Nevada (+1.2 percent), and Oregon and Washington (both +1.1 percent). 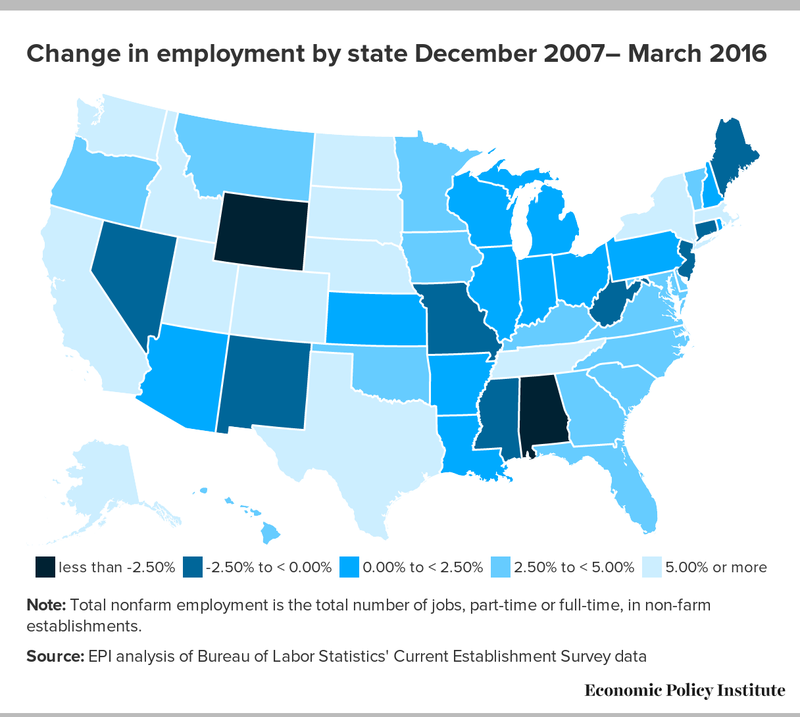 Of ten states that lost jobs, the hardest hit states continue to be energy dependent states like North Dakota (-1.0 percent), Wyoming (-0.8 percent), and Alaska (-0.3 percent). Arkansas was also tied with Alaska, losing 0.3 percent of employment. The slowdown of unemployment rate declines could partially be explained by positive trends in another important indicator: labor force participation. From the fourth quarter of 2015 to the first quarter 2016, 46 states and the District of Columbia added people to their labor force. This represents an acceleration compared to previous quarter-to-quarter changes where only 41, 32, and 39 states saw increases in 2015Q2, 2015Q3 and 2015Q4, respectively. This could suggest that people who had left the labor force due to insufficient job opportunities or stagnant wages are returning in light of generally positive economic trends. We sorely need this, given that a key indicator of labor market attachment, the employment-to-population ratio of prime-age workers (ages 25–54) has only recovered about half of its decline since the recession hit. Policy can help give a welcome boost to this trend. Besides monetary policymakers continuing to hold off sharp interest rate hikes and letting the recovery continue, another way to make it easier for people to enter the workforce is to commit public resources to providing childcare on a national scale. In addition to boosting labor force attachment, such bold steps would offer several other important benefits to workers’ future work prospects and earnings potential, especially among women.